This is the sensational show ending finale with the nights performers and production crew with the entire McCaw Hall on it’s feet and singing! “Hey Jude”. On August 23rd 2014 The Pacific Northwest celebrated the The 50th Anniversary of The Beatles 1964 Seattle Performance In Seattle, Washington. 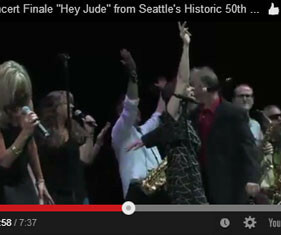 This historic event featured legendary Northwest Musicians a 50 piece orchestra and a stunned sold out audience at Seattle’s beautiful opera house Marion Oliver McCaw Hall.